Boston Symphony Orchestra double bassist Benjamin Levy was born in Cooperstown, New York in 1980 and grew up in Pennsylvania and Colorado. While in high school he studied with David Potter, and spent two summers studying with Stuart Sankey at the Aspen Music Festival. Mr. Levy has had chamber music collaborations with soprano Dawn Upshaw, the Borromeo String Quartet, the Hawthorne String Quartet, New England Conservatory’s First Monday Series, Boston Musica Viva, and Collage New Music. In 2002, while a Fellow at the Tanglewood Music Center, Mr. Levy was the recipient of the Maurice Schwartz Prize and was reviewed in The New York Times for his performance of Jacob Druckman’s Valentine for solo double bass. 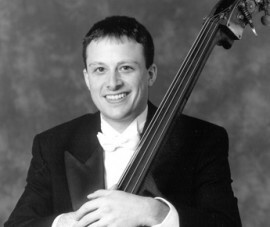 A graduate of New England Conservatory and winner of the George Whitefield Chadwick Medal, Mr. Levy joined the bass section of the Boston Symphony Orchestra at the start of the 2003 Tanglewood season and was appointed 3rd chair of the orchestra’s bass section at the start of the 2007-2008 season. Mr. Levy is also on the board of directors of Music For Autism, a non-profit organization committed to raising public awareness and improving the quality of life of individuals with autism and their families through music. In 2004 Mr. Levy joined the faculty of The Boston Conservatory, where he is currently the head of the school’s double-bass program. Mr. Levy is also a member of the faculty at Boston University’s School of Music. Mr. Levy’s teachers have included David Potter, Todd Seeber, Timothy Pitts, Paul Ellison, and Stuart Sankey.